Well, we had a great day having Fletcher at home! We just hung out, cooked some burgers and had friends stop by. It was a wonderful holiday for us! Fletcher was in a great mood today, except for when I wanted to get a family picture! I told him we can't have Miss Sherry come over every time we get our pictures taken! 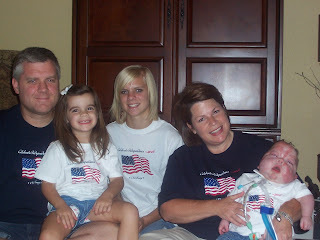 :) I love the fourth of July mainly because Fletcher has been in our home for all of his fourths! 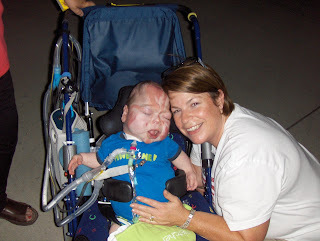 Fletcher still lived at home when he had his first fourth of July. 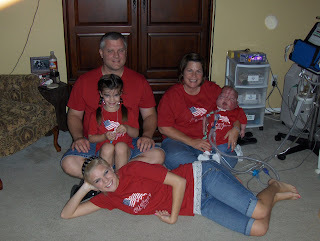 He was at home on oxygen, but at home! We watched fireworks in the parking lot at TCC. This is the first year we brought Fletcher outside to watch. He seemed to enjoy it as long as his wheelchair was moving! 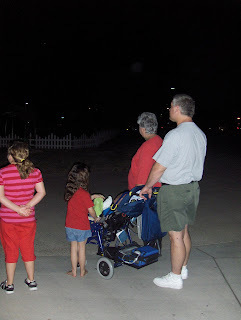 So we took turns walking forward and backward with him facing the fireworks! 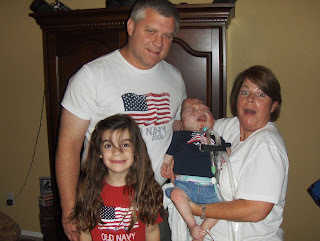 Our friend Andrew's family brought him out of his unit to watch the fireworks also. It was good to get to hang out with them! 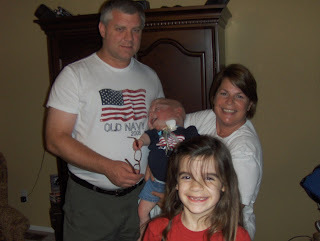 I became obsessed this morning looking through pictures trying to find all of our Fourth of July Old Navy t-shirt pictures. I can remember all of them but I couldn't find but a few. So I decided to go with Fletcher's first since that's when we became a family of five! I think Fletcher is going to end up doing a lot of things with his feet. You've seen him with his pillow, today he amazed me with his tenacity at getting this football to his hand! Check it out! Love the Old Navy T shirt pics. I'm so glad to hear that you all had a wonderful day. Look at Fletcher's legs. He can move that one straight up beside his head. WOW!! Love the football with the belly shot! Reminds me of some guys who are a little older than Fletcher. He's so proud of his GOOD throw. Amazing legs and what an arm on that boy. Tag You Are It!!!! Go read my blog.